Who got Hitchhiker's Guide to the Galaxy? Discussion in 'Archived Threads 2001-2004' started by Tom Morgan, May 11, 2002. How does it look? I have not been able to find it locally. The best it's ever looked. I especially like to be able to freeze-frame and study all the graphics of the 'guide'. Funnier than I remember! Sound is clear in mono; have not tried the remastered stereo. Still haven't found it yet. I will check BB again this weekend!! Peter McM, Where did you get yours from? The Laser's Edge in Carmel, IN--proud sponsor of this forum! It was a couple days' late arriving, though. I visit their store in person, but their online service is great, too! I went to 42 stores looking for this title to no avail. What I watched of it looks nice, though the menus on the extra features disc don't exactly give a clear description of what each selection really is. www.heroscapers.com is a great resource if you play Heroscape! I still have not found it and I have looked in three different BBs Multiple times since it has been released. Got mine at Laser's Edge too. Cheap too! I found my copy at Tower Records on the day of release. Circuit City did not have any when I went there. This is the best HHGTTG has ever looked and I'll bet that it's the best it can ever look. Thanks for the replys. I went ahead and ordered a copy from Digital Eyes since I already have an account there. I've only read the books a couple of times. How does it compare? Is it too dated? I'll agree with the sentiment that it looks about as good as it can. Shot alternately on video and 16mm film, it's a very cheap production, which ends up being one of its funniest and most charming qualities. I had it on a pre-recorded VHS which was recorded in EP, so the DVD looks like a million bucks to me. Of course, it doesn't look GREAT by reference standards, but its a good DVD. I was most surprised by the nice colour saturation they were able to achieve. Every time I've ever seen it, on TV or video, it's looked very muddy and washed out. Hmmm, I don't know how to answer that. Is it dated? Yes. Is that a problem? Not for me. Have you ever watched Dr. Who? 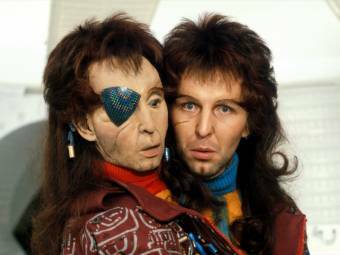 Wait'll you see the killer SFX work that went into creating Zaphod Beeblebrox's dual head. What a great DVD set. I love the books and the TV series, so it's a total joy to own this. Make sure to watch the production notes - lots of fascinating trivia! One little warning: Don't watch the outtakes if you have little kids around. Lots and lots of swearing involved. Jimmy, did your copy of HHGTTG not come with the index card? It describes in a bit more detail what is in each section of the Special Features disc. Overall it looks 100% better than my old (glitchy) VHS did and the Stereo mix sounds great, I'm hearing stuff I missed before. ps. there are two Easter Eggs. One on Disc 1 and the other on Disc 2. I ended up ordering this online. I went to Best Buy on release day and they not only had no copies in store, but they had none on order either. I suspect this is going to be the case in a lot of their stores. Can't say whether i got it or not.... We will need to demand more rigidly defined areas between doubt and uncertainty.